or you may Down load this PDF file complete and fax to the UK National coordination unit on 00 44 870 240 3738. – 24 hours notice required. 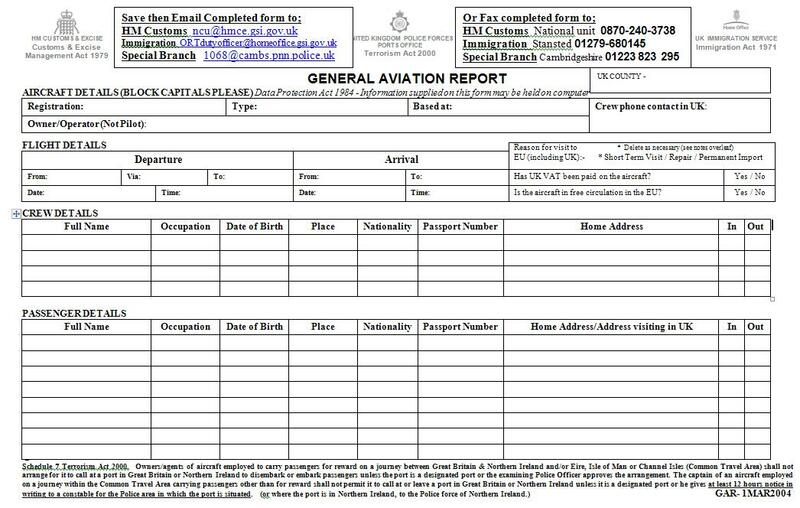 Read all 3 pages of the file for other telephone and fax numbers + instructions.For flights from Channel isles, Isle of Man, Ireland (north and south) you should notify Cambridgeshire special branch on 00 44 1223 823 295 fax 12 hours notice required.00 44 1223 823219 phone.u are unable to meet the above requirement land at a suitably manned point of entry. eg, Cambridge, Southend, Manston etc.